Two summers ago, we migrated my family from our metro Detroit home to Traverse CIty, roughly 240 miles, so I could take a new job at the idyllic Interlochen Center for the Arts. Deciding to accept the position was easy; selling our house in Troy was surprisingly easy, too (at an economy-adjusted loss, of course, but any sale in which the seller didn’t have to write a check was considered a win at the time — and still is); leaving our family and friends was naturally the hardest. Another non-trivial consideration was the availability of coffee and coffeeshops. Despite all the press over the last few years, Detroit is still a thriving area in many ways, and, certainly in the northern suburbs, a Starbucks is never far away. After living and working there my entire life, every route I took was subconsciously optimized to ensure that the easy acquisition of a Starbucks was a certainty. Every morning, I was there. Many important meetings were held in its jazz-infused interiors. I would send people on “Starbuck runs” around 2pm to provide some sparkle to a lingering afternoon or some energy for a late night. Traverse City, while one of the only economically growing regions in the Great Lakes, is a much smaller town, and there is only one Starbucks on the map — located in Meijer, no less. Could we — could I — survive after over a decade of more than one Starbucks a day? My own love of coffee began in Ann Arbor in the early 90s, when I was a literature student at the University of Michigan. Before then, the coffee in my life was over-adulterated with sugar and milk, more or less a bastardized form of hot chocolate. But, in Ann Arbor, every morning as I walked past Espresso Royale on the way to Angell Hall, the downtown streets alive in a way only a college town’s can be, the aroma of coffee beckoned through the crowds to me. Suddenly, the drink that had been an astringent, bitter, burnt drink from a worn Mr. Coffee at home had a new, cosmopolitan, out-on-the-town character. As I continued my twice-daily walks past the coffeeshop, I became more and more interested in the evident happiness of the students walking out with their double-cupped treasure. One afternoon on the way back from classes, I caught the silhouette of the iconic Professor Williams sitting at the counter, accompanied by a book as thick as a couch cushion and a tall cup of coffee. Sensing an opportunity, I stepped inside to small talk, ordered a coffee, and the rest is my caffeinated history. One thing to note about the coffee I am talking about is that I am not focused on what my fast Canadian friend Tim Purdie calls a Fivebucks: A custom foo-foo latte or mocha (though Espresso Royale does offer what I consider to be the best mocha you can find). When I describe my favorite drink, I am talking about a freshly-ground, perfectly-hot, black-as-night, strong-as-acid coffee with absolutely nothing added to it. I don’t mean to sound Frasier-Crane-snobbish, but in the end this is what coffee is to me: simple, pure, austere. If you have to put something in it to make it taste better, it isn’t coffee to me. If you prefer it all laced up with other ingredients, that is okay, too — the soul of another is a dark forest — but the specific coffee for which I search and yearn is clear water brewed with beans, served quickly, sipped slowly. Aaah. Thankfully, there is a true Starbucks in Traverse City. Sadly, it is in a Meijer. It has no windows. It does not play jazz. Its only view is of the produce section. The majority of clientele, as in many parts of this region, are retirees. But, the coffee really is Starbucks, the baristas are extremely nice and learned my drink by heart within a week (I have now checked in there 150 times on Foursquare), and you can use your Starbucks Gold Card with a little bit of effort. Having to walk through the automatic doors into a grocery-store setting to get your coffee isn’t the general vibe that you are looking for when looking for Starbucks, but if you need your fix, you need your fix. I would say that either the water or the mix of coffee creates a less-bold brew than I am used to, but if you are looking for a Starbucks as you drive up the bay to a winery or secluded beach, this is the place. Frenchies Famous and their new sign. How can you not want to go in? Tiny little Morsels is hardly more than a lean-to, but the coffee fills the space with verve. 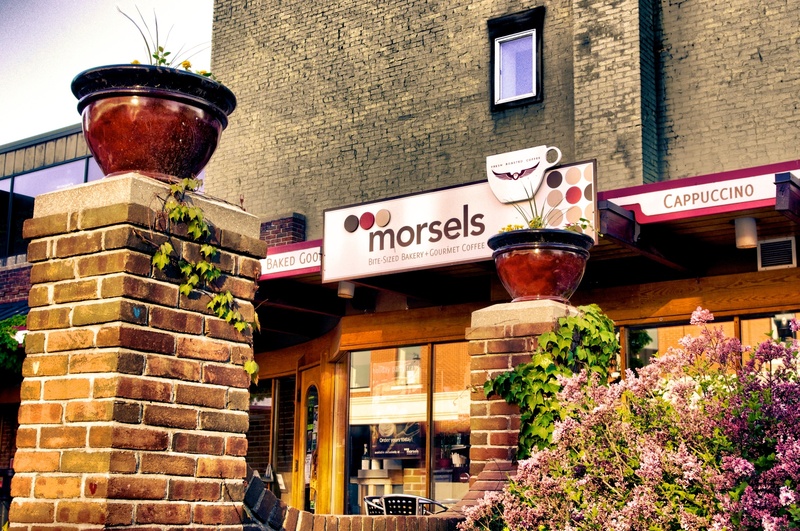 I’m embarrassed to say how long it took me to try the coffee at Morsels; I had always thought that it was a bakery more than a cafe. By accident, one morning as I was driving by I noticed a sign I hadn’t before: Intelligentsia Coffee. From a holistic brand perspective, the 22% of my heart dedicated to coffee is still wedded to Starbucks, but I had read about Intelligentsia, was interested in their story, and was thrilled to have an opportunity to finally try their coffee as brewed by professionals. I was not disappointed. Or perhaps I should say that I was disappointed in myself for not walking through their doors sooner. The dark roast that Morsels brews is smooth, vibrant, and just a touch smokey (the good kind of smokey). The people in this ultra-tiny restaurant-bakery-cafe are extremely friendly as well. If you are in downtown TC and Morsels is open, you have no excuse to drink coffee anywhere else, including the many other coffee shops within walking distance. 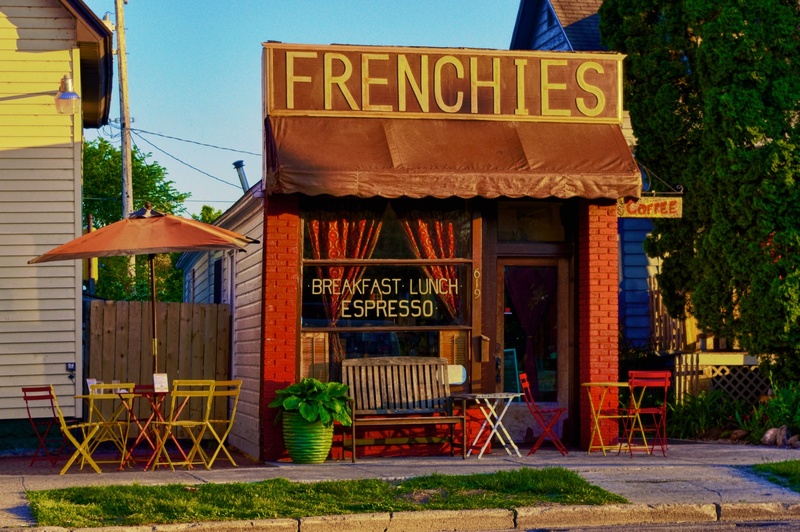 Grab a coffee and some of their signature bite-sized bakery morsels, sit on their outside patio or go for a stroll, and consider yourself lucky to live in a world where such fine coffee, great downtowns, and beautiful scenery — peeking at you from just around the corner — dare to exist.